A blog where women are equals. Heart Yourself blog is all about empowering women and sharing inspirational stories about overcoming something. Or simply learning to love yourself. So happy to introduce our new Sterling Silver Heart Yourself Hearts. These are one of a kind and are made of 100% sterling silver. This unique heart is the center of our company, and exactly why our company got started. We wanted to create meaningful jewelry for every women to have constant reminders that they are loved and beautiful. Each heart is carefully made and casted by our Goldsmith that is located locally in Tempe, AZ at the family owned and operated jewelry store called The Jewel Smith. So when you buy jewelry from us, not only are you supporting our charity of choice Fresh Start, you are supporting an American made company. So wear our delicate sterling silver heart everyday for a constant reminder to "Heart Yourself." Imagine and believe. Let your mind SOAR with our sterling silver airplanes. Wear our delicate charms as a daily reminder to believe in yourself and let your creative mind soar. These necklaces come in 16inch and 18inch chains and retail for $48. Feel good when you are buying a piece of jewelry from us, as portions of our proceeds go to charity. When life throws you a curve, fight for what you want. Curve bars are very special to me. They symbolize that when the path you've been on sudden curves instead of going straight forward, that you just need to fight for what you want and go for your dreams. I've personally had a lot of experiences where I've been thrown curves and this piece is very special to me. These delicate pieces of jewelry retail for $48 dollars and come in your choice of sterling silver or gold filled. You have the choice of wearing your curve on a 16inch or a 18inch chain. 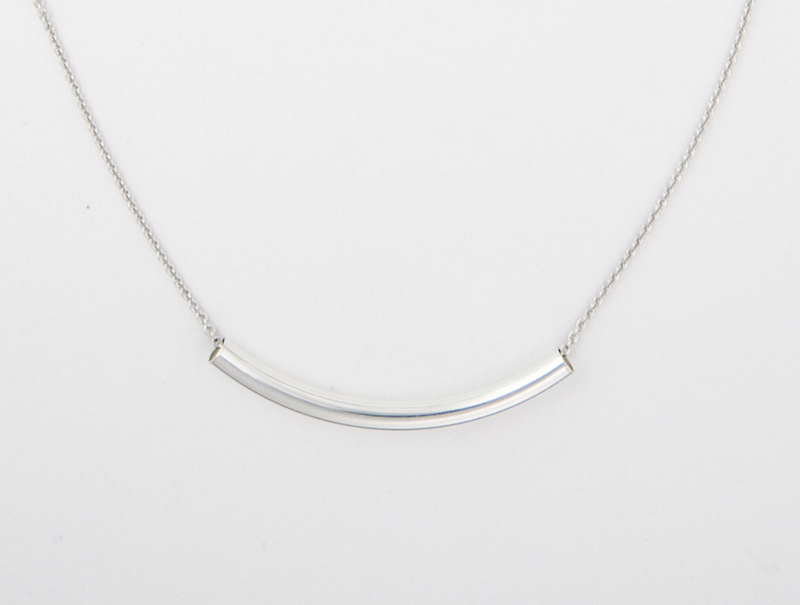 Wear your curve daily as a reminder that you can get through whatever life has thrown your way. Get the perfect balance of happiness with our Bliss Bars. I've been wearing my bliss bar non-stop! This is definitely our best seller and can be worn with any other piece of jewelry whether it be ours or other statement pieces. Above are a few examples of how you can rock your bliss bars. We have large Bliss Bars or mini's and even some with a little diamond for you ladies out there that like a little bling. Heart yourself first and everything else will fall into place. Large sterling silver heart, with a small gold vermeil heart. This delicate love heart has "yourself" engraved on the back to help remind you to "heart yourself" daily. Heart yourself blog is going to be a place where women can share their inspirational stories about what ever they want to share. Let it be a place where we are all equals. Lets encourage each other instead of discouraging each other. I'm going to start this blog space off by sharing my own journey launching project Heart Yourself. There's a million reasons why I wanted to launch Heart Yourself. It completely happened organically and I couldn't be prouder of my new venture. I have a hair blog called Confessions of a Hairstylist where I teach and inspire the everyday women about how to do their own hair. I believe I encourage women to look and feel their best through good hair. So, with me having an online presence, I got to thinking that I really wanted to take advantage of being on the world wide web. I got to brainstorming and knew I wanted to do something charity related, but wasn't exactly sure what. The other week while I was on the elliptical at the gym, I started glancing around at everyone and started noticing the women who walk with their heads down as they are ashamed or not overly confident in their own bodies. It really got me thinking on how cool it was that through great hair, you can instill confidence in the everyday women, but there has to be something more that I could do. Then I suddenly got the idea that women just need to love them selves no matter what. That's when Heart Yourself was born. I thought, how cool would it be to have a daily reminder to have women empowerment and love yourself each and everyday from a special piece of jewelry. I immediately called my Mother in Law Sue who is a jeweler. She owns the most unusual Jewelry store in Arizona called the Jewelsmith in Tempe, and has been in the business since the 70's. She loved my idea and we quickly started making up some samples of some delicate yet trendy jewelry pieces. I then decided that my Charity of choice was going to be Fresh Start which is not only local, but it's right up my alley on trying to encourage women empowerment. Fresh Start is a non-profit organization dedicated to help empower women through the services of the Jewell McFarland Lewis-Fresh Start Women’s Resource Center. It is the first comprehensive self-help center for women in the country helping women and empowering them. Fresh Start has different types of neat mentoring programs, self- esteem services and much more! I felt like it's a great fit for what I'm trying to achieve and really hits home. I got the best design gal in the business Melanie from My Billie Designs to start on my branding. And then Heart Yourself was brought to life. I can't tell you how good it feels to be doing this. You know when you're not sure where you are going, but you just know its the right path? That's how I'm feeling right now. Women empowerment is so close to my heart. It is what drives me to be a better mom, wife, person, hairstylist each and everyday. I know not everyone has the courage to go for their dreams, so I'm hoping that everyone knows that they are able to do anything that they want in life, as long as they continue to reach for it. Now, the jewelry I've created won't give anyone magically power, but I hope that the pieces can be a reminder to heart yourself, pick yourself up from a bad situation or have the courage to aim high. Struggling with self esteem and body image issues my whole life, putting myself on the web has been a personal journey that I've really struggled with. I started filming my YouTube channel when I was 6 months pregnant and still have some baby weight to lose. But through this personal and professional journey of my own, as funny as it sounds, it has given me a lot of confidence. And I really owe that to my viewers and fans that come back every week and leave the sweetest comments for me. I have finally accepted all of my flaws and have been really loving myself lately. Call it narcissistic if you will, but I call it one of my biggest accomplishments. So going through what I have in the past (which is for another post), having my new found confidence and truly learning to love myself, I feel that everything is falling into place. I hope everyone is liking the inspirational jewelry we have created and If you want to keep up with monthly deals follow Heart Yourself on Facebook, Twitter and Instagram.